As an applied mathematician, Steffen started his career 2000 in the automotive industry as a method- and software developer for mathematical and simulation software, with a special focus on applications using mathematical optimization, numerical simulation and artificial intelligence. 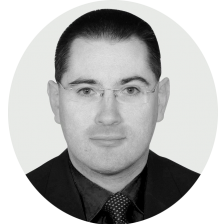 Since 2017 he is Head of Consulting at slock.it. Here he’s responsible for various blockchain related projects from proof-of-concept prototypes up to real-life-products, with a special focus on applications that connect IOT and blockchain technology.